MORGANTON, NC (October 22, 2012) – Custom landscape designs Appalachian Naturescapes was the focus of the Oct. 6, 2012 segment of UNC TV's "In the Garden with Bryce Lane" television show. Check out the video on UNCTV's website! 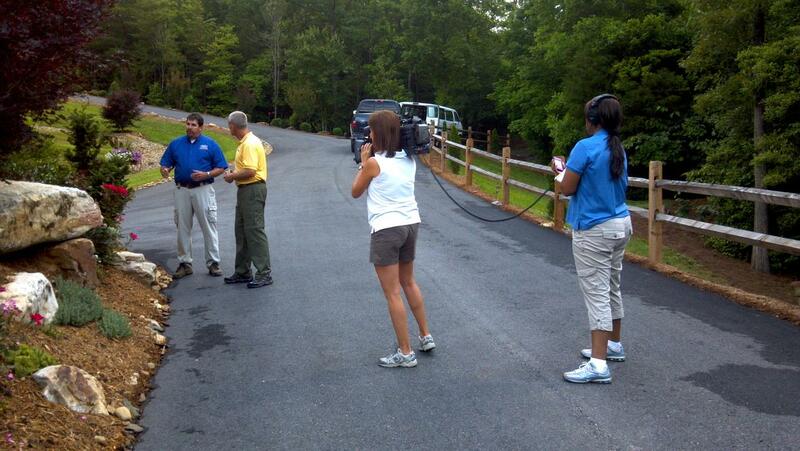 Filmed on site at Appalachian Naturescape's Morganton facilities, the broadcast aired on local UNC-TV channels. Bryce Lane, the host of "In the Garden," is a national award-winning instructor in the Department of Horticultural Science at N.C. State University. A perennially popular teacher, Lane has earned the University's Outstanding Teacher Award three times. 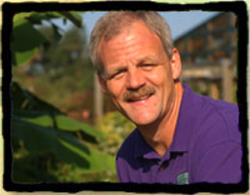 Appalachian Naturescapes owners Carl Meyers and Terrel Knutson earned degrees in Landscape Design and Horticulture from N.C. State University in 1996. "Bryce was one of our professors in college and we've had a relationship with him since," Meyers said. "We see him every year at trade shows and we speak to his classes every year about the transition from the (NCSU) program to the real world." Bryce's crew spent about a week in Morganton during June 2012 filming Meyers, Knutson and other Appalachian Naturescapes staff as they worked on various projects. "We had a blast with him," Meyers said. "We went to a job site and he was able to document a true work-in-progress project. We were proud to have been on camera and to feature some of our finest work." 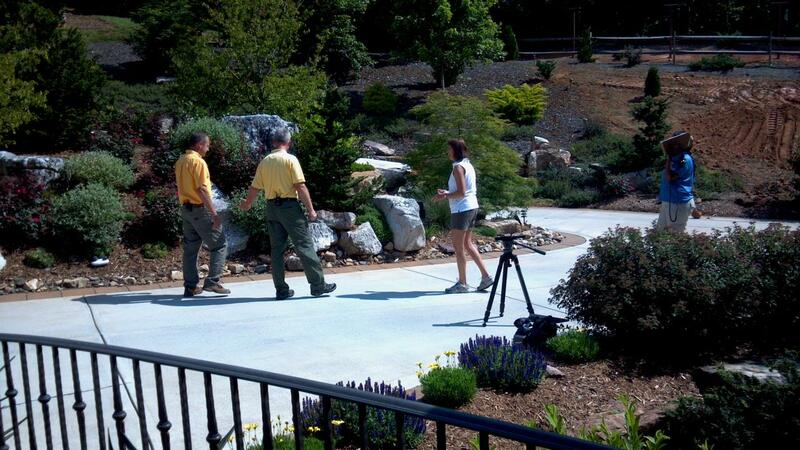 "In the Garden" is a 30-minute weekly educational program hosted by Lane. It introduces viewers to the science behind gardening. Additionally, the series is offered in three 26-week seasons as a college course through the NCSU's continuing education program. Viewers will learn the fundamentals of horticulture -- how plants grow, plant identification, home landscaping techniques and information and ideas they can use in and around their homes. 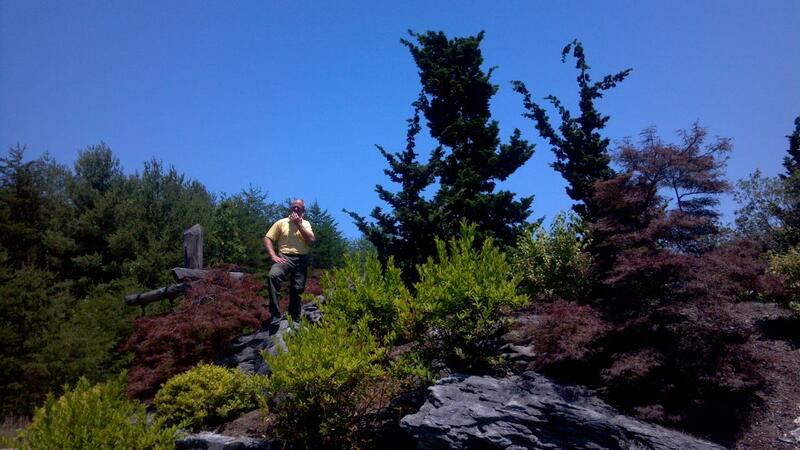 Locally owned and managed, Appalachian Naturescapes installs and maintains landscapes and gardens for residential and industrial properties. 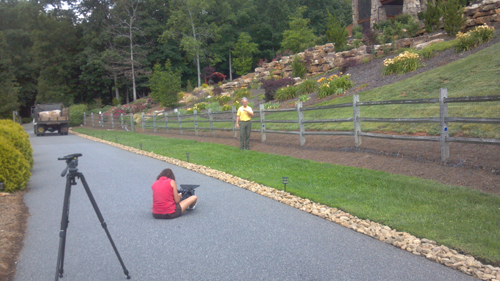 Bryce Lane interviews Carl Meyers for his In The Garden television show. Bryce Lane and his crew document Appalachian Naturescapes' business. 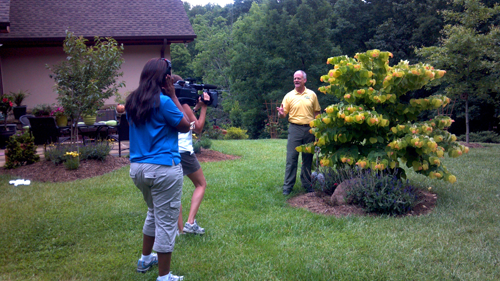 "In the Garden With Bryce Lane" will air on UNC-TV beginning Oct. 6, 2012 at noon. Opening segment for "In the Garden"
Up on a big out cropping!